When looking around any warehouse or manufacturing facility there will undoubtedly be many things that you take notice of. In many cases, the last thing you are likely to notice is the floor. This, however, can actually be a major problem. The floor can actually serve as a safety guide in itself especially if you use floor markings such as photoluminescent tape or other color-coded tapes. When managed properly, the floors can help to improve safety, cut down waste, and make the environment much better for everyone involved. The problem many facilities have is not really understanding how to properly mark their floors to get the best possible results. In addition to helping to improve your facility directly, proper floor markings can be an important step in remaining compliant with OSHA. OSHA Standard 1910.22, for example, requires that companies mark pathways and alert employees to hazards. As you’ll see, floor markings can be a great way to comply with this requirement. Every facility is going to need something a little different when it comes to floor markings, but the following ten scenarios can help to provide some ideas or examples of what may work best. 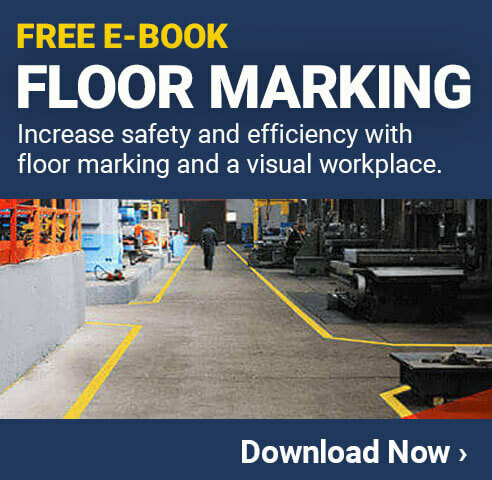 Read through these options and see which ones will work in your facility so that you can begin implementing an effective floor marking program as soon as possible. One of the most common scenarios where using floor markings can be helpful is within aisle ways. This is especially popular in warehouses or other storage facilities. The aisles are typically quite busy with people adding and removing inventory as well as machines driving throughout the area. This is why it is so important to do everything you can to keep everyone safe. Marking Color – The standard color for aisles is yellow, but in some cases other colors can be used. If your facility uses another color for a specific hazard, for example, that may be appropriate. The important thing is to ensure the color is easy to see and everyone knows what it means. Marking Location – The next thing to look at is the placement of the floor markings. You’ll normally want to have the markings along the edge of each aisle so people who are driving hi-lows and other machines can easily see where they can and can’t go. For wide aisles, it may be helpful to put a ‘dotted’ line down the center as well. Type of Markings – Choose whether you want to use floor marking tape, or floor marking paint for your facility. In most cases, floor marking tape is faster and easier to install and it can actually last longer if it is applied properly. No matter what type you use, make sure to choose a high quality option that is made specifically for this type of environment. In addition to these standard considerations, try to think of anything else about your facility that may need special attention. Taking a little extra time up front will help ensure your floor marking strategy for your aisles works properly. In almost every facility there is going to be a need to store inventory or other items on the shop floor. These are typically things that will be used in production, or else completed items that are waiting to be picked up and transported to another area. Whatever the case it is important to keep them properly organized so they are as safe as possible. For many items, it can be very helpful to place floor markings around the area that they should be kept. This will help ensure that they are not sticking out too far, which could cause a hazard. For example, if one area of your facility has inventory that is stored on a pallet until it is used, you could apply floor markings in a square area that is slightly larger than the pallet itself. This will make it easy to see where new pallets of inventory need to be placed when they are delivered. Another benefit of this type of floor marking is that it will help people driving through an area to see where the inventory is kept. This can help to prevent someone driving a hi-low, for example, from accidently running into the items. Floor marking may replace traditional warehouse aisle signs, and in some cases will not. One of the best ways to use floor markings is to help guide people to safety during an emergency. Unfortunately, this is also one way that many facilities overlook. When emergencies occur, it is essential for people to know the fastest way to get out of the facility or to another designated safety area. People typically know how to evacuate from their normal work area, but in facilities people move around a lot so it is a good idea to ensure they can quickly escape from any part of the building. Designating one color or pattern for emergency exit floor markings is a great way to help show people the proper escape path from anywhere in the facility. Ideally the tape should have an arrow or other directional indicator on it so people know which way to move. In fact, some facilities use floor marking tape that is an arrow, which makes it even more effective. Another thing to consider when planning for an emergency exit is that the electricity may go out during the event. Fortunately, there are a variety of ‘glow in the dark’ floor markings that you can purchase. In the event that the lights go out, the markings will glow so people can follow them safely. When people think about floor markings, they typically don’t think about how they can actually help to prevent slip and fall injuries. The fact is, however, that floor marking tape, which is one of the most common types of floor marking, can actually provide added traction in many areas. There are some types of floor marking tape that are specifically made to help improve traction and prevent falls. This can be especially effective in areas that often get wet, such as entrances and exits to the facility. Simply placing the floor marking tape down in tight rows will help give people the extra security they need when walking. Keep in mind that while it can be effective in many situations, it shouldn’t be seen as a replacement for things like removing ice or drying up water as quickly as possible. The traction provided by floor marking tape is largely going to be a ‘backup’ item that can help to keep everyone safe. Another option many facilities are considering for their floor marking strategy is known as floor safety signs. These are typically large signs that are made of the same type of material as floor marking tape. They can be custom printed to convey a specific message, or there are also many standard signs to choose from. For example, you can have a traditional stop sign that is applied directly to the floor at the end of each aisle or near corners. The major benefit of using safety floor signs is that they don’t take up any room or get in the way like traditional signs often do. They are simply applied directly to the floor where they are easily seen, but people can still walk on them or drive over them without causing any problem. There are many scenarios where this type of floor marking can be used to quickly convey a message to the people working in the area. The following often overlooked area when it comes to floor markings is the areas outside the facility. Of course, parking lots will normally have the yellow lines painted on so people know where to park, but that is likely just the beginning of what needs to be done. Driving Lanes – Applying a floor marking to areas where people are driving can help keep them in the right places, which can reduce the risk of accidents. This is especially important when people are driving large machinery, or vehicles that have limited visibility. Walking Paths – Just like the driving lanes, having designated walking areas is also very important. It will ensure people know where they can walk safely, so they don’t move over to where vehicles may be traveling. Traffic Rules – Parking lots and non-public streets don’t typically have the same types of traffic rules as people are used to, so having clear markings is important. You can use floor marking paint or other items to display speed limits, stop signs and many other helpful instructions. Just like indoor floor markings, it is a good idea to consider all your options when marking the floor or ground outside. In addition, make sure you select the proper type of floor markings that are made specifically for the outdoors. In many facilities one of the most dangerous hazards is that of falling off of a ledge. This is especially risky because people are often carrying large items that make it difficult for them to see an upcoming set of stairs, man hole in the floor or any other type of ledge. This is where proper floor markings can be extremely helpful. One common scenario would be in and around a loading dock, where there is likely going to be a large ledge where the trucks typically pull up. Placing floor markings near that ledge will give people the warning they need to slow down and avoid falling. Along Ledges – Place markings at least a few feet from any ledge so people will have time to stop walking or driving once they see the markings. Before Stairs – This will let people know that a flight of stairs is coming up so they can take the proper precautions. Around Floor Openings – If there is a man hole or access panel in the floor, make sure to place floor markings around them to prevent people from accidently falling in. Uneven Flooring – If there is a ramp or other type of uneven flooring, it is a good idea to give warning of this as well. Any time the floor levels change, it can cause someone to lose their balance and get injured. Floor markings are often seen as a safety or organizational item, but they can also help to streamline the actual production process throughout the facility. Facilities today are using floor markings to easily identify different steps along the production line. Using floor markings to create a path that a particular product will follow from beginning to end can be extremely helpful. Having an easy to follow production path can help to get new employees up to speed quickly and easily, while also benefiting existing employees in many ways. The floor markings can either be a simple line, arrows, or even numbers depending on the setup of the facility. Take some time to plan out what would work best in your facility and create an easy to follow production path using floor markings today. One of the most beneficial uses of floor markings in most facilities is going to be for alerting people of specific hazards. Using floor markings in addition to traditional signs and safety training can be one more way to help keep people better aware of their surroundings, which will reduce the chances of accidents and injuries. The important thing to keep in mind when using floor markings to alert people to potential hazards is that you want it to be as clear as possible what the hazard is. This will typically take some training, but it is well worth the effort. One of the best ways to keep the information readily available and on the minds of the employees is to print off a handout that they can review. Toxic Chemicals Solid Red Wear necessary PPE. Only authorized personal may be present. Of course, you will need to set up your own list of hazards and what type of floor markings will be used to identify them. Take some time to plan it out, and then begin training everyone in the facility. When done properly, this can be extremely helpful in minimizing the risk throughout the facility, and helping to ensure everyone is taking the proper precautions. The last scenario in this list involves the actual emergency equipment and personal protection equipment in the facility. It is important that this type of equipment is easy to find when it is needed, and floor markings can be very helpful. Putting a specific color marking on the floor around this type of equipment will make it easier for people to see, especially during the high stress emergency events. An example of this could be a fire extinguisher, which may be hanging on one side of a large pillar, but invisible to people on the opposite side. If the pillar has red floor marking tape all the way round it on the ground, those in the area will be able to easily see it, and know that there is an extinguisher available. Think of other types of emergency equipment you have in the area, and how you can use floor markings to make them easier to find and use for everyone in the facility. No matter what you are using floor marking for in your facility, it is essential that you train the people who will see it so they know exactly what it means. In addition, you’ll need to make sure you maintain the markings so that they do not fade away or get removed over time. For most types of floor markings it is possible to clean them with your normal floor cleaning machines, and in the event that they are damaged, make sure they are replaced or fixed as soon as possible. When properly cared for, floor markings can last for many years without any significant issues.